Create, Design, Share in these high-tech, multimedia, group work spaces. Visit our Reservation System and use your MSU NetID to reserve a room now. Note: If your library account is blocked from checking out MSU Library material (by fines, bills, overdue recalls, etc. ), that situation must be resolved before you may check into the room. Login and check your library account. The Collaborative Technology Labs are intended to support student group projects assigned in MSU academic courses. Occupants may be asked to vacate the room if it is not being used for its intended purpose. Additional rooms are located in the Business Library. Visit our Reservation System and use your MSU NetID to reserve a room. List of software available on CTL computers. Use the Interactive Smart Board and computer in E102 to enhance group work and collaborative efforts. The computer will play DVDs and will project them onto the Smart Board. E102 can seat up to 10 people. Use the 50" monitor to enhance group work and collaborative efforts wirelessly. Connect PC, Mac laptops or mobile devices to display on the screen by installing a driver on your laptop or smartphone. Use the interactive SmartBoard to project your work from the in-room Windows and Mac computers, or wirelessly from your laptop/mobile device. The Windows computer will also play DVDs and Blu-Ray discs, and a USB HD camera is provided for videoconferencing. VHS (NTSC or PAL) tape playback is available upon request. These rooms are equipped with a Windows PC that includes a USB HD camera for videoconferencing. 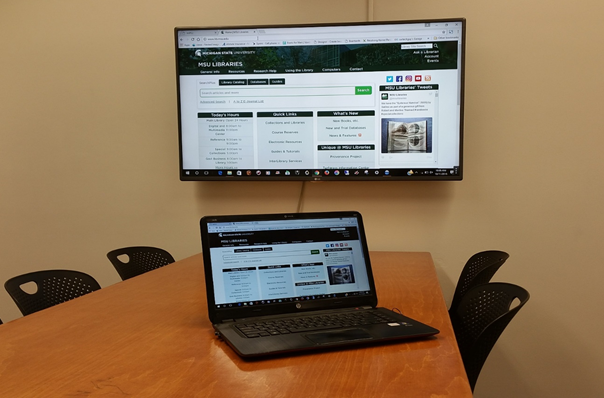 Laptops can be connected to the 50" plasma screen over HDMI, or you can display any laptop or mobile device using the wireless display system. A built-in electronic whiteboard with annotation overlay allows you to save your work to USB flash drive. A separate Blu-Ray/DVD playback system is also provided.